Grundy slots one on the run Grundy puts on the afterburners to slot a fantastic goal on the run. Will Hoskin-Elliott kicked three goals in the final quarter. While their round one win against Carlton needed to be taken with caution, Thursday night's result showed there is reason to be excited about the Tigers this season after starting 2-0 for just the second time in seven years. The Tigers had a fresh look in round one, with a small and quick forward line that forced turnovers and converted them into scores. After an AFL-high 88 tackles in the opening week, the tackle count was much lower on Thursday night (56) but it was a different game. There was still significant forward pressure, and it was no more evident than when captain Trent Cotchin desperately lunged for Tom Phillips for a goal-saving tackle in the last five minutes. "That's something we can control, the opposition can't take that away from us," coach Damien Hardwick said of the tackling focus pre-game. It looks like a winning style. 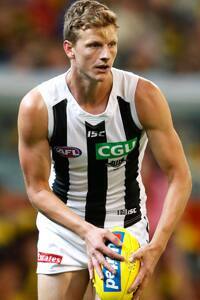 Collingwood is 0-2 for the first time under coach Nathan Buckley and the forward line needs attention. The three-pronged tall forward line didn't work in round one, with Jesse White, Mason Cox and Darcy Moore combining for just one goal. Cox paid the price at selection but it wasn't a quick fix, with the Magpies again struggling on Thursday night. Alex Fasolo shaped as the most dangerous forward, having kicked 3.3 in round one, but he was blanketed superbly by Dylan Grimes and kicked 0.3. White booted two, but the goals came from the midfield, with Will Hoskin-Elliott (three) and Adam Treloar (two) their most dangerous going forward. Young tall Darcy Moore worked hard on Alex Rance but finished with just one goal. It's no secret that Richmond's midfield recruiting was designed in part to let Dustin Martin spend more time forward, but at what cost? Martin is clearly in magnificent touch right now, and we saw glimpses on Thursday night. But we also saw him spending long periods anchored as the deepest forward missing out on opportunities to impact the match. In the third quarter he appeared frustrated as players missed opportunities to kick long to him in one-out contests. He had just three possessions and one mark for the quarter, with a head injury to Ben Griffiths seemingly playing a role in his deployment forward for longer periods. He was finally rewarded with two important goals in the fourth term and finished with 25 possessions. For a player who arrived at Punt Road Oval with high hopes as a No.12 draft pick, Ben Lennon has not made his mark in three full seasons. His fourth year shapes as a career-defining one and Thursday night was a step in the right direction. His moment to step up came late in the third quarter. The Tigers had their tails up but they needed someone to seize the moment when Lennon cleverly intercepted Tyson Goldsack's kick in. He lined up from 48m and converted, giving Richmond the lead for the first time since early in the second quarter. It was a turning point in the match and has the potential to spark Lennon's season, with the 21-year-old finishing with one goal (could have been two but he failed to get a toe on the ball as Bachar Houli's long shot dribbled through) and three score assists. While the game came alive in the second half, the first two quarters were a cause for concern for both teams, especially as they set finals as their expectation in 2017. They will both be hoping the third-rate skills on show were an aberration. For Richmond, it was their ball-use through the middle of the ground, racking up 45 turnovers to Collingwood's 36. The Magpies held on to the ball much better, but they could not convert when they went forward, kicking five straight behinds in the second term before kicking two late goals. Even reliable and skilled midfielders Scott Pendlebury and Adam Treloar were shanking gettable shots on goal, robbing the Pies of what should have been a sizeable half-time lead.